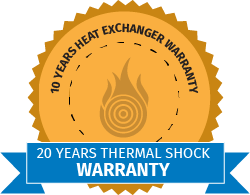 Why do you offer such a complete thermal shock warranty? “Thermal shock,” or “boiler shock,” is a type of stress in boilers caused by heating, and can lead to serious, irreparable damage to the boiler, as well as danger to those around the unit. Thermal shock usually happens when cold water is sent back into a hot boiler system, or when a boiler is run at a heating capacity it wasn’t built for. Our patented stainless steel heat exchangers are a state-of-the-art design that provides a unique counter-flow process and allows for the highest thermal efficiencies in the industry. The counter-flow process means that the vessel is completely shock-proof, so water can be returned to the system at any temperature. Because of this, engineers can design heating systems for maximum efficiency without the return water temperature as a limiting design factor. For Gasmaster products, thermal shock simply isn’t a concern.